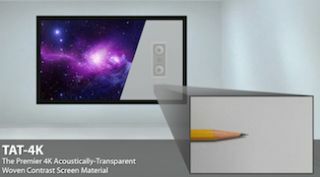 The What: Severtson Screens will showcase its TAT-4K Titanium Acoustically Transparent and SAT-4K Acoustically Transparent projection screen lines during InfoComm, booth C6648. The What Else: The SAT-4K offers a seamless projection screen with virtually no size limitations, and, like the TAT-4K, is also available as an option for Severtson’s new 4K thin/zero bezel fixed-frame projection screen solutions. Acoustically transparent, the entire sound stage can be placed directly behind the screen at the same horizontal axis, allowing the vocals and the special effects to be completely in sync with the brilliant images on display. This will allow for a completely immersive audio and video experience. Available in Impression, Deluxe, and Deluxe Curved configurations, the SAT-4K screen meets or exceeds all industry standards for optimum video and acoustic performance, providing reference-quality reproduction of the digital image combined with true fidelity of the original soundtrack. The TAT-4K is compatible with 2D, Active 3D, 4K, and laser projection applications. Also available in Impression Series Fixed, Deluxe Series Fixed, Deluxe Curved Series Fixed, Pro, and Cinema Frame configurations, the TAT-4K comes in heights ranging from 37 inches in an Impression Series home theater screen, to a whopping 15 feet, 10 inches in a Pro-Frame or cinema screen.